We want your students to be healthier and to perform better in school! We, at UC Cooperative Extension, know how hard it is to cover Common Core. Teach nutrition on top of math and reading?? No way! Teach nutrition along with math and reading. Now you're talking! Achieve Common Core and at the same time, educate students about how to stay healthy! Check out how our programs correlate to the California Common Core below! If more than 50% of your students qualify to receive free or reduced price lunches, you get all of the materials for free! Some materials can be purchased from the UC ANR Catalog. Helps children become aware of food and nutrition by reading storybooks with food-related themes and using hands-on nutrition education and physical activities. "My Amazing Body" is a nutrition curriculum for students to learn about the amazing things their body can do and explore how they can keep their amazing bodies healthy through eating nutrient-rich foods, getting plenty of exercise and sleep, and practicing good hygiene. "Good For Me and You" is a nutrition curriculum that allows students to explore what is good for a healthy body and lifestyle, study My Plate, and are introduces to the concept of nutrients and what they do for their bodies. They learn that eating breakfast every day, drinking healthy beverages, exercising and keeping food safe to eat all are good to their body. It's My Choice. . . Eat Right! Be Active! (Grade 3) "
It's My Choice...Eat Right! Be Active!" is a nutrition curriculum where students examine the key nutrients provided by each of the five food groups of MyPlate and learn how to make healthy choices. They identify how vitamins, minerals, carbohydrates, and proteins provide the essential building blocks needed for good health. 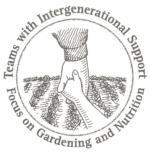 TWIGS focuses on gardening and how the foods we grow are used in our bodies as building blocks and as energy providers. Students are given the tools to plant and care for a garden. This curriculum is flexible, and the lessons can easily be used in a classroom, after-school program, or club. "Serving Up MyPlate" is a new collection of classroom materials that helps elementary school teachers integrate nutrition education into Math, Science, English Language Arts, and Health. This yummy curriculum introduces the importance of eating from all five food groups using the MyPlate icon and a variety of hands–on activities. Students also learn the importance of physical activity to staying healthy. CATCH stands for a Coordinated Approach to Child Health. CATCH is developmentally appropriate, non-elimination games and activities that are fun and easy to set up. Each card features detailed instructions for how to play the game and lists the equipment needed. Encourages students to eat fruits and vegetables every day and gives creative ways for the students to successfully do so. Power Play! is designed for maximum learning using integrative and fun activities, and taste-testing to hold the interest of this age group. Offers teachers a direct link between the garden and nutrition education. This multi-disciplinary curriculum enriches students' capabilities for observation and thinking, and encourages them to develop a wide range of skills. Set of five units in which students learn about factors affecting weight and health including personal behaviors, the environment, and biology. The curriculum assists students in examining their personal food choices and preferences, their food environment, lifestyle related diseases, and analyzing results using scientific reasoning. Finally, they apply what they have learned by making personal decisions related to their diet, physical activity, and overall health. Designed to improve the eating and fitness choices of teenagers. Lessons include nutrition basics, web-based diet analysis, information about energy and calories, label reading, exercise, fast food, breakfast, and media influences. Investigate how the food you choose affects the amount of money you spend and your health. Calculate how much money you spend on food, explore motives for your food choices, examine the nutritional quality of the food you buy, and identify easy ways to make healthier, lower cost food choices.